I had wandered down to the beach on the last night of my stay in Tulum not necessarily in search of some sort of cinematic Eat, Pray, Love moment but rather to try and better understand the moment of spirituality that made British DJ and Crosstown Rebels label head, Damian Lazarus, come back year after year and ultimately settle on as the home for one of his biggest annual parties, Day Zero. Fittingly, the story of Day Zero begins at the end. Specifically, December 21st, 2012, was the date Lazarus initially threw the event to commemorate the end of the world according to the Mayan Calendar. "At that moment I had been fighting against making parties here in Tulum," Lazarus explains. "I had been coming to this area for many years and people had been asking me 'when are you going to do a party here?' [but] I was always like 'no, this is a special place.'" But Lazarus admits that ultimately he couldn't stem the coming tide as parties began to inch down the coast from Cancun. Over dinner with the artists and crew the afternoon before Day Zero was set to open its gates, Lazarus cradled an adorably restless puppy that he had found on the festival's grounds just a couple days earlier and was debating on whether to adopt it once all was said, all the while teasing friends and guests about the many new exciting surprises he had in store for the party later on that night. 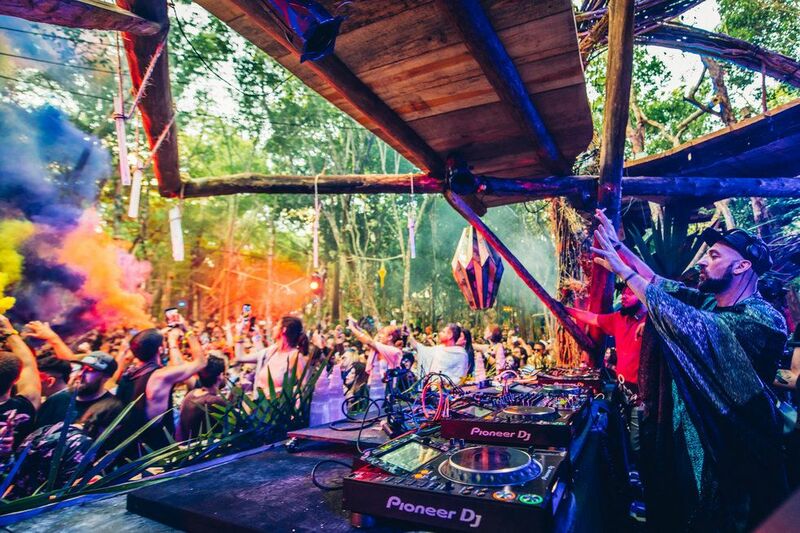 Day Zero is just one of the many events that have sprung up to fill the void that BPM Festival left and now in its sixth year it has gotten bigger than ever before. With the addition of a second stage, scores of performers and art installations across the entire grounds, Day Zero isn't laid out like a traditional festival field but rather slotted in among thickets of jungle trees connected by a series of winding paths that weave in and out disparate clearings and freshwater caves. Wandering around through out the night it was easy to get lost, but it was exactly those moments when you felt completely turned around that you would stumble into a lines of blacklit neon-painted trees or an impromptu Mayan ceremony being conducted above a raging campfire. 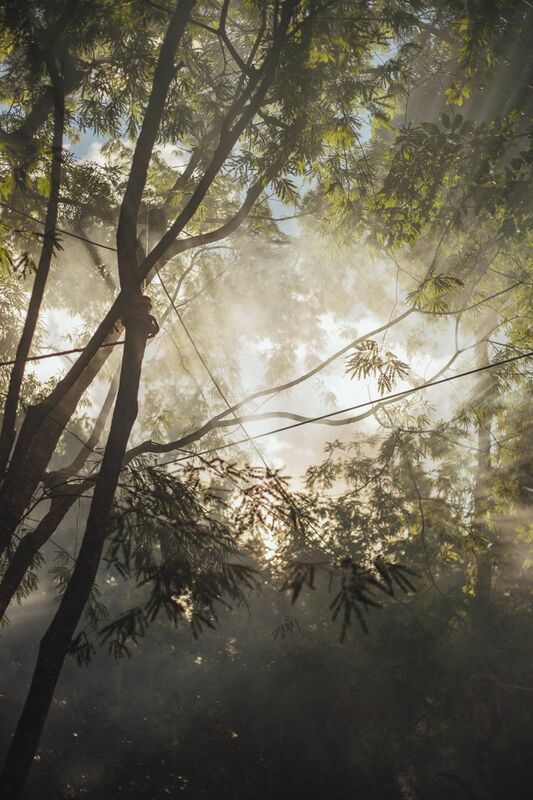 Walking into Day Zero, the canopy of trees bathed in swathes of soft light gave the natural park an otherworldly air. An array of lazers emanating from the mainstage danced electrically across the branches as the ground pulsed with the constant throb of a 4/4 beat, drawing entering denizens towards their energetic epicenter. The lineup featured a selection of forward-thinking house and techno acts like Four Tet, Black Coffee, Blond:Ish, DJ Three, and Lazarus himself that each brought their own unique takes to the night's soundtrack. A proper rave, the night's festivities lasted from dusk til dawn so no one blamed you if you availed yourself of one of the many hammocks, mattresses, and futons strewn about the grounds for a quick disco nap. 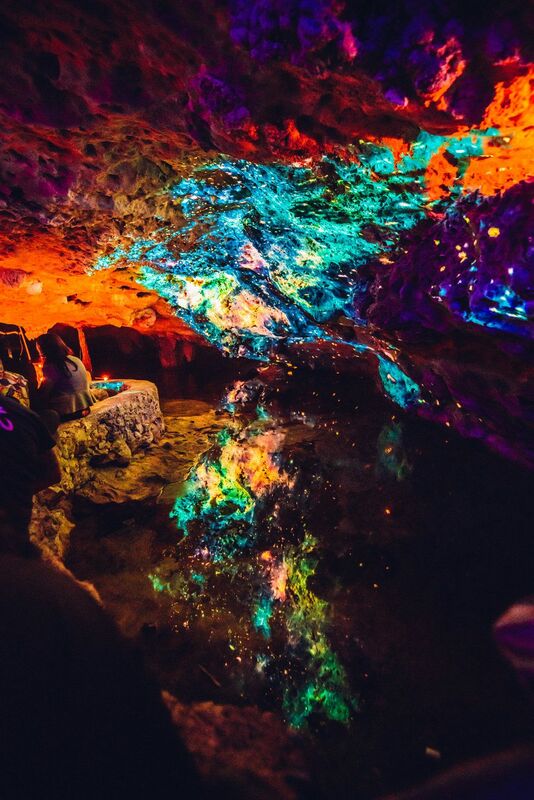 As a late night chill swept the jungle I found myself ducking into a pleasantly balmy cenote (freshwater limestone cave) to nod off in as projections of exploding galaxies illuminated the cavern ceiling. Despite the many magical moments lying around every corner, Day Zero doesn't posture itself as event that is completely detached from its surroundings. Signs alerting attendees to poisonous spiked trees served as a reminder of the very real wilderness that the party inhabits. Talking with Lazarus, the frailness of the park's ecosystem seems at the forefront of his mind as he details all of the ways Day Zero has gone above and beyond to take care of the land. "We managed to connect with a company for this event that offsets the carbon footprint of every artist and crew member's flight financially with some ecologically sound companies," he explains going on to detail the various ways the festival has sought to cut down on plastic, waste, and clean-up to make sure that the area is in better condition than they found it. "I don't profess to be a major guru on the subject of sustainability," Lazarus prefaces. "I'm learning every day and I thought that in a place as beautiful as [Tulum] that for this event we needed a new agenda for what we can and should be doing." Part of that new agenda included the appointment of the festival's first ever sustainability manager to make sure that no stone was left unturned when it came down to minimizing their footprint. Constant pick-up crews and signs that encouraged visitors to "leave no trace," made it so that being conscientious was always in the back of one's mind as you walked from stage to stage. As I watched the sun rise over the tops of the trees atop the massive viewing tower, called the "Temple," Lazarus had insisted I climb up, there was a feeling of serenity that permeated through the leaves. The natural splendor of Tulum with its ancient ties to Mayan culture juxtaposed against the artificial euphoria of a contemporary rave was an odd combination that somehow managed to come together in a supernatural harmony. 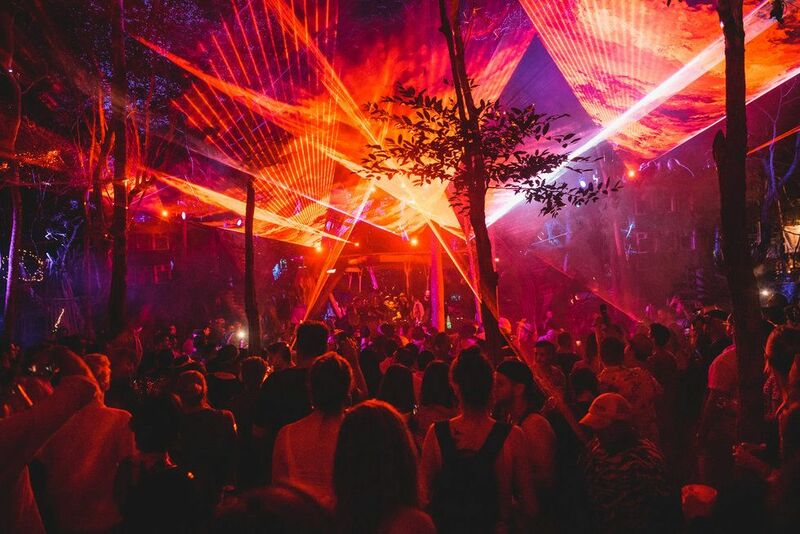 Having come to understand firsthand the genuine thought, care, and passion put into bringing Day Zero to life, I had a whole new appreciation for the poignancy a rave could have in the middle of a jungle. Riding back to the hotel bleary-eyed, and a little delirious from just having pulled an all-nighter dancing, I may not have unlocked any grand truths about myself but I did know that I would walk away with an unbelievable experience that I would most likely look back on in disbelief my whole life.